“Diabetes is a serious challenge for many children and teenagers. Their well-being depends on various decisions that they have to take throughout the day. Can electronic games be of any help?“reported euronews correspondent, Denis Loctier in this edition of Futuris. Ilona lives in a small town not too far from Amsterdam with her husband and kids, Tatum and Arjan. Both Tatum, who is 11, and her brother Arjan, who is 13, have diabetes. “The school is half an hour away by bike. So every morning a kid needs to think what he’s going to eat during the day, and how much insulin is needed. They need to keep that in mind throughout the day to come back home safely, without getting low blood sugar somewhere on the way,” explained Ilona Geurts. Tatum and Arjan are taking part in a European research project using electronic games to help children with diabetes.Special apps on their tablets train them to choose the right food, count carbohydrates and keep track of their activities – in more of a fun way than books can ever do. The research involves three hospitals and two diabetes organisations in Italy and in the Netherlands. 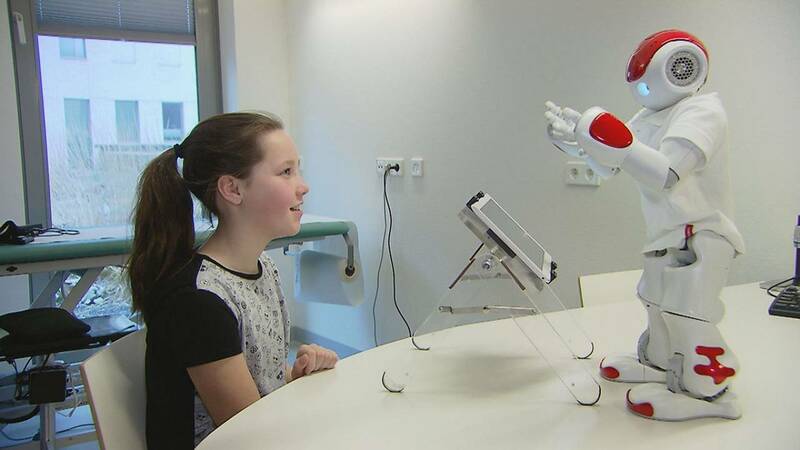 On their clinical visits, kids can play with a robot programmed to be not just a trainer but a friend. It plays like a human, occasionally making mistakes which kids can correct. “People have a tendency to humanise robots, and humanisation helps us with the bonding between the child and the robot. That improves their engagement,” explained Rosemarijn Looije, Researcher in human-machine teaming, TNO; PAL project coordinator. Paediatricians can program the robot to set individual objectives for each child. Researchers noticed that kids who have an electronic pal like this are happier to come back for their regular check-ups. “Kids love this robot! Children don’t usually like going to the clinic, they prefer funnier things to do like playing with their friends. But this robot makes them want to come. They take selfies with the robot, show their friends that diabetes is not just a burden,” Roos Nuboer, paediatric diabetologist, Meander Medical Centre pointed out. In one quiz game, the robot offers the kid a choice of actions in daily life situations such as an invitation to a birthday party or a selection of dessert options. The player is supposed to make the healthiest choice. Next, the roles are switched so it’s the robot who has to guess the right answer. “For this project, we needed a robot that recognises emotions of the child, which knows how to make a sentence, how to select questions — we had to create all that. And the visualisations on the tablet that we’ve developed are very important,” Bert Bierman, Robotic engineer, Produxi, explained. Although the robot doesn’t provide medication advice, it helps to understand symptoms of diabetes-related conditions. Researchers made sure the robot doesn’t share kid’s personal information with others. “Of course, a very high hypo- or hyperglycemia should be reported to the parents, but the child should be in control of what to share,” said Rosemarijn Looije. Researchers are planning to get more children involved in this experiment, and to develop a cloud-based network that will link robots and tablets, helping the electronic pals to learn and grow with the children.